VSS (Virtual Simulation Systems) required a tracking sensor that delivered full 6DOF (6 Degrees of Freedom) measurement for their Virtual Reality Range Finding Binoculars (Vector 21). The Polhemus G4 was selected because of its full 6DOF tracking, no-line-of sight requirements, and its easy set up and portability. Vector 21 is a military device used in many countries around the world. VSS, based in Australia, has created a replica of the hardware and incorporated state-of-the-art virtual simulation technology for training purposes. The current standard VR model is a replica of the device called Leica Vector 21, however customization for other types of visual devices is an option. By integrating Polhemus magnetic motion tracking, VR Binoculars are being tracked in 3D space, with the movement reproduced in the virtual world in real-time. The Polhemus G4™ was selected because of its full 6DOF tracking, no-line-of sight requirements, and its easy set up and portability. The G4 tracker is a wireless product with a small SEU that can be belt-worn, as needed, as the SEU is roughly the size of a mobile phone. The G4 sensor easily mounts on the top of the binoculars. The VR binoculars are plug-and-play, and come equipped with a USB/HDMI connection, as well as a mounting plate for tracking solutions. The VR Binoculars are great for an array of coordination efforts, including coordination of ground units. It allows the user to know the precise range related to where he or she is looking. The device also has a compass bearing, which reflects the degrees at a precise level. Because Polhemus proprietary electromagnetic tracking is used, the tracking is in real-time, without any appreciable lag time. There is zero simulator sickness associated with use, not often the case with many other VR visuals powered by other types of technologies. There are several benefits to using the VR Binocular training device. By replicating the user experience virtually, there are significant cost savings, by preserving the utilization of human resources and necessary training materials that would be used in a typical mock training experience. The time alone involved in properly setting up such an experience is significant. Also, using virtual methods allows for introducing less common or more challenging training scenarios that are not practical to set up in a live training exercise. 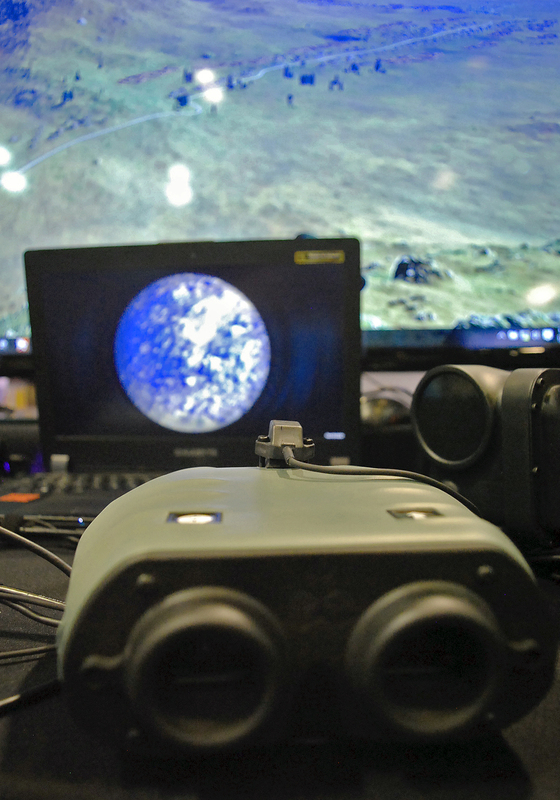 The Vector 21 VR Binoculars can be used with a dome screen, or can be an integral component in a full simulator, such as a sniper or a JTAC simulator. It can also be used completely by itself, depending on the training objective. Other training capabilities for Vector 21 include: call for fire, close air support, target description exercises, information gathering, battlefield commentary, and much more. VSS (Virtual Simulation Systems) is a groundbreaking company, developing new and custom solutions for both military and civilian simulation needs. They offer an innovative range of products in the synthetic training realm and are constantly developing new technologies to meet cost-effective outcomes. VSS designs and builds custom simulators, full procedural or part task trainers to suit any needs at any budget. These range from vehicles to aircraft, projection domes to virtual displays and more. They offer Commercial Off The Shelf simulators that are modular and can be combined or customized in many ways. Visit: www.virtualsimulationsystems.com for more information. Polhemus introduced over 14 new products in just four years.